In this edition of “Video Games and the Bible Plays,” we jump into quirky collectible-card and strategy game, Ironclad Tactics for the PS4! 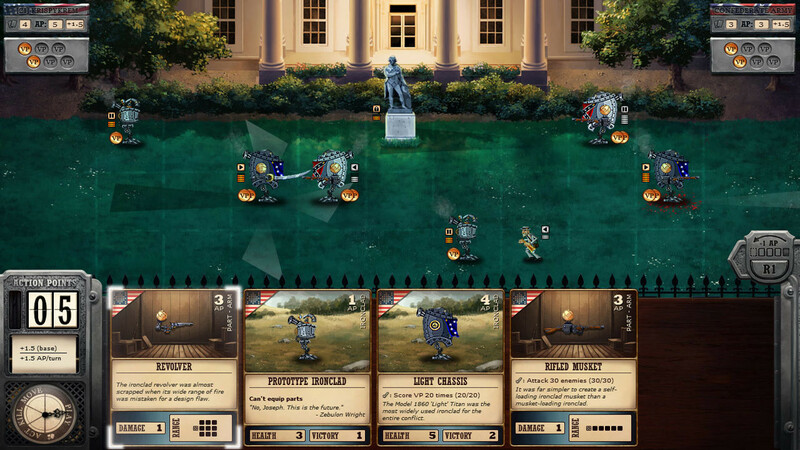 Ironclad Tactics is the unique fusion of a Collectible Card Game (ala Magic: The Gathering) and a turn-based strategy title. Set during the Civil War, you’ll assemble an army through smart deck-building and use your skills to defeat enemies across the United States and Europe. Online multiplayer is available (though not populated on the PS4 in my experience), allowing you to tackle the entire story in co-op or test your skills and deck-building prowess against others. At one point in your adventure, you meet a “Madame Millie.” Her profession is hinted at but not directly depicted or referenced. In very few instances throughout the story, profanity is used. Although the jet of blood and resulting splat (far right side, beneath gray Ironclad) is cartoon-styled, some viewers may take issue with this depiction. This entry was posted in Uncategorized and tagged Bible, christian, christian gaming, christian review, christianity, family-friendly, gaming, God, Ironclad Tactics, PS4, review, Steam, video game, video games and the Bible, Video Games and the Bible Highlights, Video Games and the Bible Plays..., Video Games and the Bible Reviews, Video Games and the Bible Video. Bookmark the permalink.